He was a horrible boss and a problematic parent. Even by his own admission, Steve Jobs’ greatest talent was for using people. Yet, probably no other corporate executive ever enjoyed such an intense popular following. He has become iconic through his celebrated product launches, which in retrospect, were just as effective crafting Jobs’ image as they were at introducing new Apple products. Screenwriter Aaron Sorkin starts with the familiar image of Jobs the showman, but pulls back the curtain to show all the personal and professional chaos roiling in his wake throughout Danny Boyle’s Steve Jobs (trailer here), the Centerpiece selection of the 53rd New York Film Festival. It turns out Ridley Scott has two films at this year’s festival. In addition to the sneak peak of The Martian, we will also see his celebrated 1984 Apple commercial heralding the coming of the Macintosh personal computer, in its entirety. It has just caused a sensation airing during the Super Bowl and it duly whips Jobs’ audience into a frenzy. However, the backstage vibe is hardly one of triumphalism. We quickly learn technical problems threaten to sabotage the Mac’s unveiling, but when informed of the glitches, Jobs is his usual motivating self. To be fair, he is under a great deal of pressure. He has had a rough time of it in the press recently, thanks in large part to Chrisann Brennan, the high school girlfriend who recently won the paternity suit she filed against him. She is also present, with Lisa, the daughter he still refuses to recognize in tow, hoping to secure greater financial support. At least the new Apple CEO John Sculley has his back, right? Boyle and Sorkin then flashforward to 1988. Ousted by Apple, Jobs is about to launch the first cube-like personal computers of his new venture, NeXT. Jobs needs to make a perfect pitch, because the word on the street is spectacularly bad. Yet, he seems to have a secret ace up his sleeve, which both encourages and irks his loyal marketing director, Joanna Hoffman. Once again, like Scrooge on Christmas Eve, Jobs is visited backstage by ghosts from his, including Sculley and Apple co-founder Steve Wozniak, as well as Lisa and Chrisann Brennan. This pattern will repeat again in 1998. Through a combination of luck and guile, Jobs returned to Apple just in time to right the sinking ship. He is about to introduce the iMac, sparking one of the greatest corporate comeback stories in business history. However, the indulgent Hoffman finally puts her foot down, insisting Jobs man-up and set straight his messy personal life. Probably no screenwriter has as many annoying hang-ups as Sorkin, but his triptych take on Walter Isaacson’s biography is kind of inspired. He literally takes the image of Jobs the pitchman that we have in our mind’s eye and turns it inside out. While everything in the film is constructed around the three big media events, we never actually see them happen. After all, they are just elaborately orchestrated hype sessions. The real drama Jobs cannot control—and it clearly vexes him. Although he is hardly the spitting image of Jobs, Michael Fassbender connects with the arrogant, insecure, borderline Asperger’s essence of the man. It is a cold, clammy performance, yet we can see how Jobs maintained such Svengali-like control over everyone in his orbit. His emotional detachment makes everyone crave his approval even more. This probably goes without saying, but he puts Ashton Kutcher to shame. Frankly, Steve Jobs the film deserves to be in the running for every best ensemble award because it is fully loaded with rich supporting turns, starting with the selflessly glammed-down and spot-on Kate Winslet as Hoffman. She lives up to Hoffman’s reputation as the only Apple employee who could stand up to Jobs. Getting serious, Seth Rogen aches with geeky dignity as Wozniak. Working as a battery of Lisa Brennans, Makenzie Moss, Ripley Sobo, and Perla Haney-Jardine all withstand Fassbender’s withering Mephistophelean presence, each developing some intriguing chemistry with his Jobs. You might expect these sequences to be hopelessly manipulative, but they are quite the contrary (at least until late in the third act). However, probably nobody does as much to rebuild their characters’ reputations as Jeff Daniels, who elevates Sculley’s stature to tragic levels nearly commensurate with that of Jobs. Again, their ruptured surrogate father and son relationship might sound like cheap armchair psychiatry, but the restraint of Daniels’ performance and the sharpness of Sorkin’s writing makes it work relatively well. 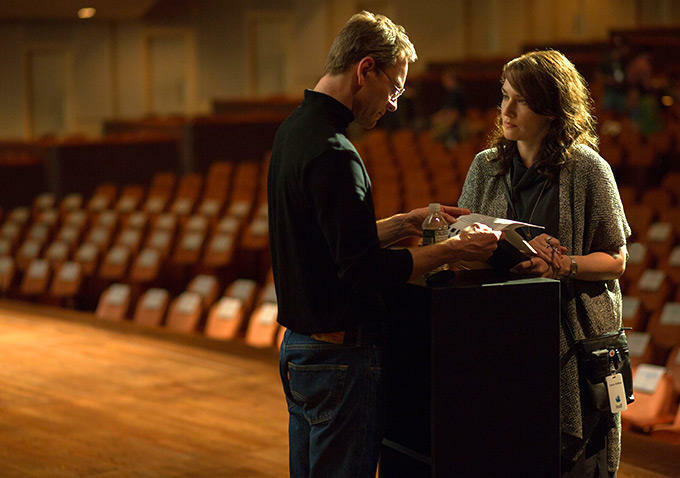 Given its structure, Steve Jobs could easily be reconfigured into a stage production, but Boyle’s dynamic visual flair prevents it from ever feeling stagey. While it is light years removed from hagiography, it is still rather hard to fathom why current Apple CEO Tim Cook felt compelled to engage Sorkin in the press. Despite the character flaws it so deliberately establishes, the film is ultimately quite forgiving of Jobs. Smart and bracingly honest, it is the best shake the Apple co-founder has had from the cinematic world since Noah Wylie played him in the TNT movie Pirates of Silicon Valley, but Boyle incorporates it in a much more stylish and sophisticated package. Recommended for old school Mac partisans and Fassbender fans, Steve Jobs opens this Friday (10/9) after playing to packed houses as the Centerpiece of the 2015 NYFF.